Recently, COAC was contacted by an Associate Producer from CNBC. The producer explained that they were in production on a documentary about the incredible growth of Amazon and needed some footage that demonstrated the scale of the growth. They had been tipped off by the Corporate Amazon PR Department to watch COAC’s video of the massive helicopter lift we accomplished for the new Amazon Fulfillment Center in Tracy CA, and gave us a call. In our conversations with the producer, we agreed to provide a selection of still images and the raw footage in exchange for a credit at the end of the documentary. We are very excited to see our work on a national show and were just told that our footage made the final edit. If you have a moment this Sunday, June 29th at 6:00pm, we invite you to give a watch. Amazon is a fascinating company and we think our footage and stills will make the program worth your time (at least for us it will be). Check out the new COAC video about the staggering airlift of 124 HVAC units onto the roof of the new Amazon Fulfillment Center in Tracy, CA. Helicopter Lifting HVAC Unit Onto Roof Of Amazon Fulfillment Center, Tracy CA. The word Amazon conjures up superlatives like the largest river in the world, the largest internet retailer and now, for COAC, the largest single-day helicopter lift in the company’s history. 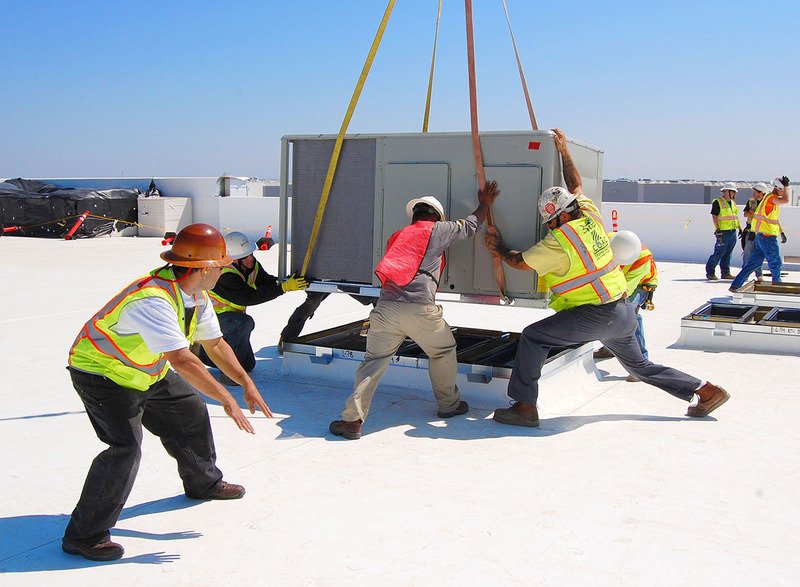 This past Sunday, the COAC construction team successfully air lifted a staggering 124 commercial HVAC units onto the roof of the new Amazon distribution facility in Tracy, CA. Every 2 minutes and 20 seconds a unit was safely flown from a large staging area onto the 1.2 million square foot roof and placed on a specifically designated structural curb. 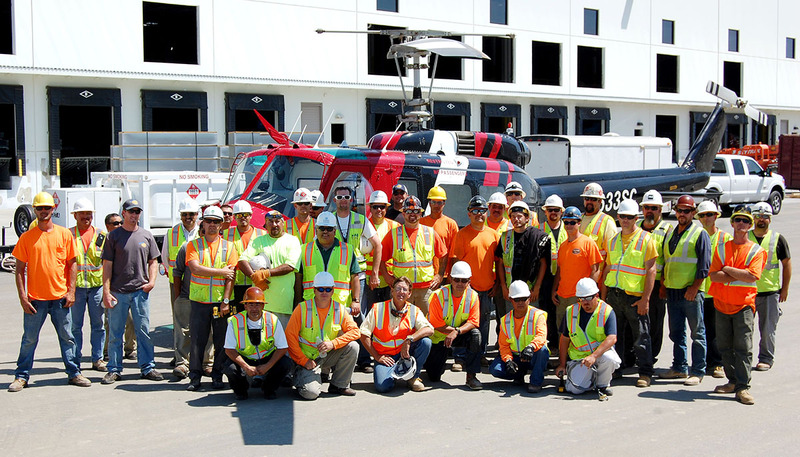 This carefully orchestrated ballet of men and machine was accomplished with a team of 27 COAC construction veterans, with additional support from Big-D Construction, and the air and ground crews from A&P Helicopters. The paramount aspect of the helicopter lift was safety. Everything from the high visibility clothes, predawn safety meetings, to the pre-lift pilot briefing hammered home the mandatory safety protocols. With over 2,800 pounds of heavy equipment swinging on a cable overhead there is no room for error. With three roof crews in place, ground crew at the ready and safety personnel surrounding all, the first lift took off at 7:32am. 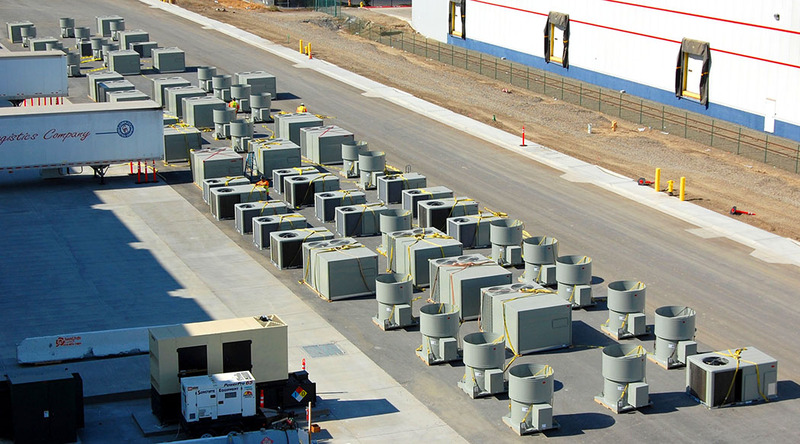 The 124 HVAC units where laid out on the newly poured asphalt in front of the building’s loading area in a very specific order of pick up. This “pick plan” was the gospel for the day. All personnel and equipment movement was dictated by this, weeks-in-planning, pick plan to insure a safe, efficient and orderly process. Over 60 HVAC units rigged and waiting to by helicoptered on to roof of Amazon Fulfillment Center. Field Superintendent Dave Armenta directs helicopter and roof crew to land HVAC unit safely. The 1967 Vietnam-era “Huey” helicopter, piloted by Erik Vandagriff of A&P Helicopters, did the heavy lifting from early Sunday morning until well into the afternoon. The entire “ballet” was directed and conducted by Field Superintendent Dave Armenta, with hand signals and more than a few choice words, making sure that men, helicopter and equipment were in the right place at the right time, 124 times. By 2:30pm, as the Tracy winds were beginning to make flying more treacherous, the last unit of the day was safely lowered onto its curb. The planning and execution of this enormous undertaking was a resounding success. The day’s accomplishment bodes well for the next lift on August 25th, where the team will lift the remaining 90+ units on to the roof of this “Amazonian” structure.